You can always get the kids eat better when you say you made it just for them in small size. I make small rotis for Konda and I can be sure that she will complete her box, same goes for doses or anything. While Pooris are her favorite, I can still get her interest raised when I say I made them in small size for her. Does that happen with your kids too? And I was thinking that maybe I should make the best use of the puris and make them power packed. So wanted to try out Spinach mixed pooris. 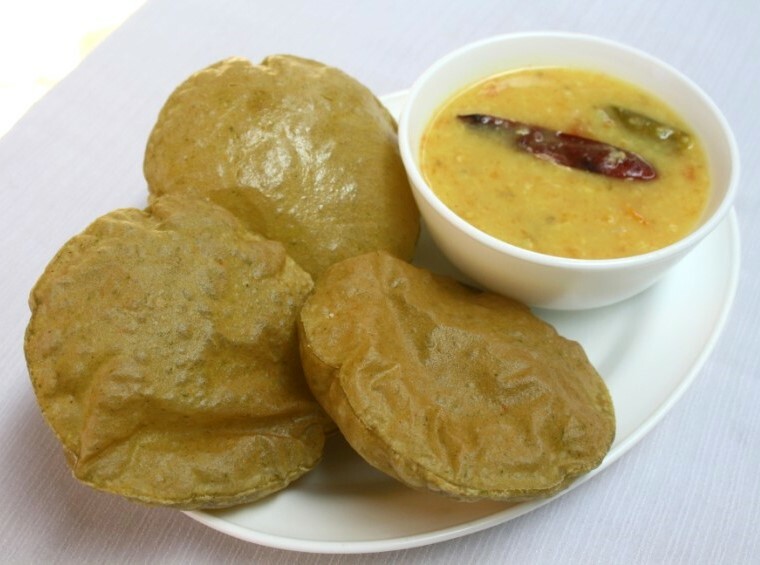 While regular pooris are something that don’t face a rejection, these nutritious pooris surely face denial as the kids are reluctant to eat a different colour. Then I thought that maybe I should make it mini pooris and try mu luck. Yes finally these mini sized pooris simply disappeared. And I plan to make Pink and Orange Pooris too, all mini bites! I had previously made this very simple and without much of the greens. This time I added more spinach leaves and spices and made them small. Wash and blanch the spinach leaves. Puree the leaves. Alternatively you can boil them if you want. Take the flour in a wide bowl. Mix spices, salt to the flour and combine well. Then add the spinach puree and mix to the flour. Knead well. Add more water if required. But remember for pooris you have to get a stiff dough. Add more puree if required. Heat a pan with oil. Pinch out very small ball from the dough and roll out into mini discs. If you want perfect small discs, cut out using a small katori or cup for even shape. When the oil is hot, gently slide these pooris and fry on both sides. Good one. My kids eat anything mini (and less or no spice) and the little one likes different shapes too!! My kids love mini version too .. so I make mini dosa and idli for them. Pooris look tasty. My mom makes palak puri, bt I've never tried them myself. Your mini ones look yumm.. Will probably try soon. That's a nice recipe Valli.Since I have not used garam masala and jeera so far and am sure that's going to bring a real difference in flavour ! Yes,here also my lill' one love mini versions..
good idea to feed greens to kids piru looks so tempting Valli. Mine likes it too if I say I have specially made it small for her. lovely 🙂 makes me wanna grab a bite !! Love palak puris very much,been a while i had them, delicious and super fluffy.. I guess a best way to make your kids eat spinach. Thanks for the entry. From the beginning, I assumed that theme was about something you prepare in bite size portions and the stuff you eat it in one go. looks great.Best way to make them eat spinach.